Different 3D monitors have different preferred parallax values—in particular, cinema screens usually require less parallax values than home or other 3DTV screens to create the same 3D effect for the same footage. Video with a less-than-optimal parallax value can appear to viewers as being too flat, lacking in noticeable depth; for parallax values that are too large, viewers can experience eye strain and headaches. Any of these problems can ruin the viewing experience. Occasionally, the 3D effect even cannot be observed at all because of an inappropriate parallax. Therefore, stereo should be adapted to the target display device. 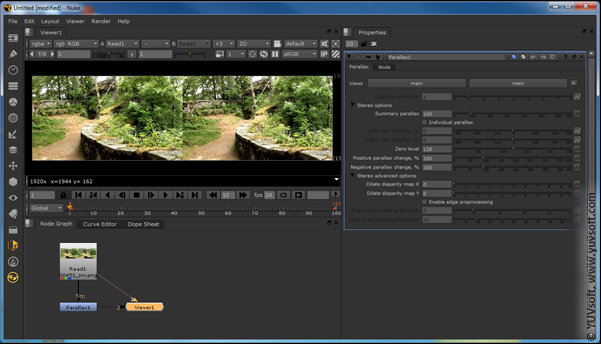 Altering source stereo parallax is not a simple task, however, especially if the stereo is the only available data. If it is converted from another format and the source 2D video is available, more-accurate disparity maps can be created, along with new stereo video with arbitrary parameter values. But even this approach doesn’t ensure that the resulting stereo will have the same quality as the source video, because precise adjustment of all stereo generator parameters is still necessary. YUVsoft offers an easy and natural way to cope with these problems—Parallax Corrector, which can change the source parallax in one step without altering other stereo parameters. The Parallax Corrector tool is designed to reduce processing time by automatically estimating disparity maps and performing stereo regeneration, so the user need only specify the desired changes in the source video. This tool can change the parallax value even for part of a scene: for example, to double the parallax of all objects behind the screen (objects in positive parallax) while leaving the parallax in front of the screen unchanged (objects in negative parallax). The screen-plane level can also be adjusted using this plugin. 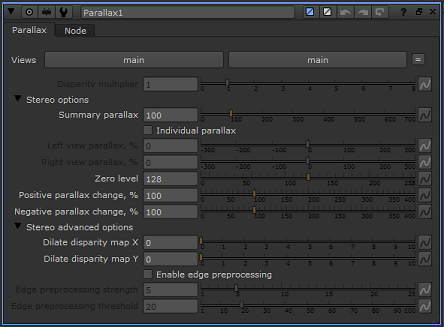 The only necessary input for Parallax Corrector is the stereo sequence; the output is the stereo video with modified parallax and other depth parameters. Parallax Corrector technology – a general description. Depth from Stereo plugin for The Foundry Nuke.